WHAT: Companies get a branded referral program that integrates with their website, Facebook and Twitter. Customers can earn prizes like Amazon gift cards, product gift certificates or other cash awards by referring friends to the company or brand; the friend gets a discount on the service or product. To receive prizes, users must first be signed up on the company's or brand's website. BuzzReferrals' analytics track clicks, sign-ups, purchases and the origin of traffic. LAUNCHERS: Jordan Linville, CEO; Jonathan Kelley, CTO. WHY: Consumers already recommend products and brands on Twitter and Facebook. People respond to incentives. Brands need tools to help acquire and maintain new customers through social media. Referral marketing produces high-quality leads because people trust their friends' recommendations. BACKSTORY: Jordan ran biz dev at NextWave Media Group, an Internet lead-gen marketing firm. Having gone to business school with the founder of energy bar maker Element Bars, Jordan helped the company create a social-media advertising tool. While working with Element Bars, he realized such a tool could be useful for all brands. GOAL: "We want to help online brands turn their customers into promoters and be able to track the impact of their social media efforts," Jordan says. BUSINESS MODEL: Charge clients on a cost-per-action basis. ON GAMING: "We monitor self-referrals through cookies and IP addresses, but it hasn't been an issue -- largely because you have to buy something to get the reward," Jordan tells LAUNCH via email. "So if someone creates an account to refer themselves, but has to buy something worth more than the reward, that would still be a profitable event for our clients. They get two sales and give up very little." CUSTOMERS/GROWTH: Not disclosing exact numbers. Jordan says they have enterprise clients including Sittercity, which matches babysitters and nannies with parents, and Angie's List, a members-only site that lists reviews of various professionals. Clients are responsible for fulfillment. COMPETITION: Extole, ShopSocially, Localbase, Curebit, InviteBox, ReferralCandy. However, Jordan says, "The biggest competitor is in-house developing programs." ON EXTOLE: "They raised quite a bit of funding," Jordan says. "They're really going after enterprise clients, like the Cafe Presses of the world." What differentiates Buzz Referrals: "We want to make it dead simple for any company to have a referral program with a self-service interface," he notes. ON EXCELERATE LABS: "The biggest value was all the different entrepreneurs and investors from around the country that we've been exposed to," Jordan says. "In June alone we met with 75 different people. It was like a year's worth of meetings in 30 days. It was like drinking from the fire hose. They really helped us think through the business process." WHO BACKED IT: Excelerate Labs and New World Ventures. RAISING: $500K to $800K, $100K+ committed. EMPLOYEES: 4 plus an intern. Clients insert a single line of code to the website to make it easy for customers to refer the brand to friends via Facebook, Twitter and email. 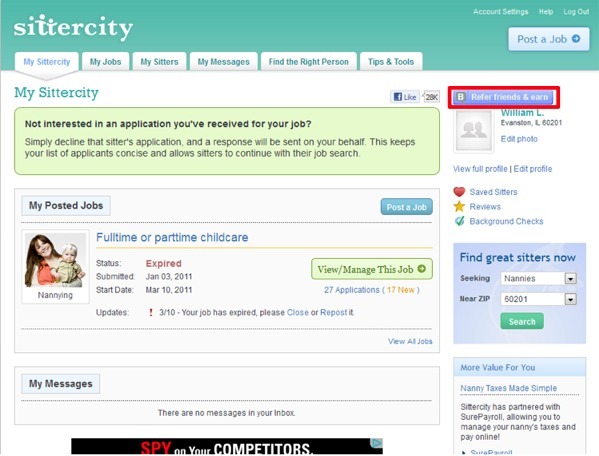 Sittercity puts the referral button in the top-right corner. In order to actually receive the incentive, users must sign up and pay for a Sittercity membership. Upon clicking "Refer friends & earn," users see the incentive for referring a friend and have the option to sign in via Facebook or email. After logging in, users select one of three sharing methods: Twitter, Facebook or email. If a user decides to share via Facebook, a "Post to Your Wall" box appears.